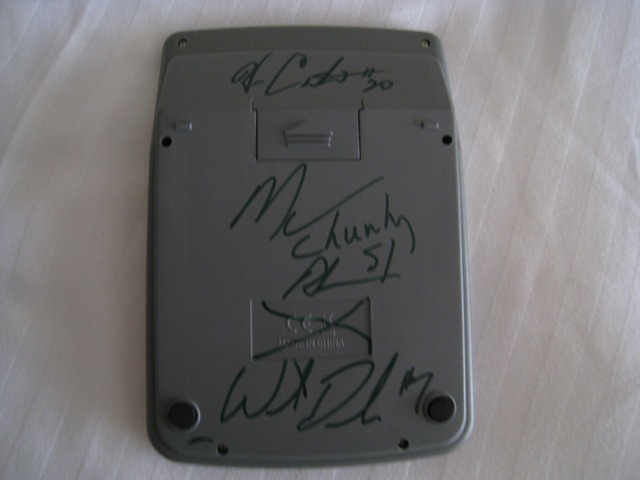 So I’m in Regina for a conference, and I happen to notice that some RoughRiders (Weston Dressler, Wes Cates, and Marcus Adams) are going to be signing autographs at the local SaskTel store on Thursday. So a plan gets hatched, and I call my buddy Mike who hasn’t left Winnipeg yet and have him pick up my Alouette jersey from home. My buddy Dylan who was here too happened to bring his Bomber jersey. 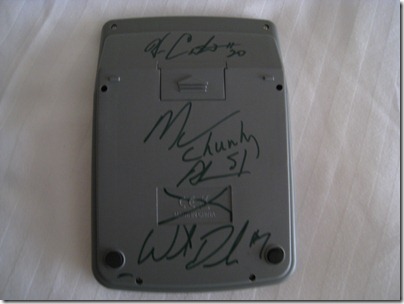 And so we set off on our adventure: to get three Saskatchewan Roughrider players to autograph a calculator (cause, y’know…tough counting to 13 and all). Thanks for being good sports guys! Good thing Weston was there to explain the joke to them.... LOL ! I am a lifetime Rider Fan living in Winnipeg, I love the rivalry and think this prank/joke was classic. - Good One. I think this topic learning is more necessary for all. We will find many useful and interesting news. Which Roughriders are you talk about? Also how many players on each side?